Adjusting Floyd Rose Floating Tremolos on electric guitars. Common tremolo problems. Floating tremolos are affected by both the string's tension (which pulls them up) and by the spring's tension (which pulls them back down). Ideally we would like the base of the bridge to sit parallel with the top of the body. In order to have the bridge sit correctly we must balance the tremolo's spring tension with that of the strings. Located beneath the bridge, accessible under the back trim plate are the springs. They are attached at one end to the spring claw (which is screwed into the body) and they hook to the sustain block at the other end. This bridge requires more spring tension to sit level. Tension can be increased by adding additional springs as well as by tightening the claw screws. 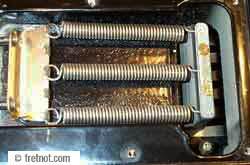 The number of springs (and the amount they are stretched by the spring claw) will effect the stiffness and feel of the tremolo arm. When changing strings on a guitar equipped with a floating tremolo it is important to use the same string gauge. Changing the string gauge places more tension on the tremolo, creating the need to re-adjust. One common challenge for vigorous tremolo users is keeping their instrument in tune. Matter of fact I know some that would call it a nightmare. Each time a tremolo is used it must return to the exact same location (center itself) in order for the instrument to be in tune. It's a fact that some models are better at this than others. Apart from properly adjusting the tremolo it is equally as important to lubricate all points of pivot and friction. Tremolo stabilizers have grown in popularity and are used by some to further tweak the tremolo's stability. When using a tremolo, slipping strings can also cause tuning problems. 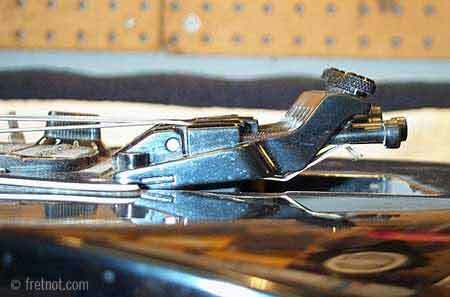 To avoid string slippage manufacturer's normally equip the guitar with a locking nut or locking tuners. Locking tuners are my personal preference simply because you can continue to use the tuning machines to tune the guitar instead of the fine tuners on the bridge. String stretching, slipping, binding, friction ...these are all culprits when it comes to tuning problems on tremolo equipped guitars. Regardless of the kind of tremolo your instrument is equipped with, friction and binding can cause tuning problems when it struggles to return to it's neutral, starting position. Pivot points should be lubricated to reduce friction. Remember ...Heavy tremolo use pulls and stretches the strings, this is a major reason an instrument requires re-tuning. Ok, so my attempt at mimicking Joe Satriani ended in utter failure and now my floating tremolo is driving me insane! Now what do I do? If your love affair with your floating tremolo is over, you have the option to block the tremolo. This essentially makes it function much like a hard tail bridge, without making any permanent or irreversible modifications to the guitar.